We’ve seen many users particularly beginners storing their cryptocurrencies on an exchange platform. 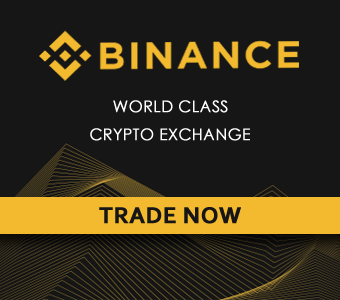 Not just for trading but they do hold a large amount of their crypto assets for a long period of time. It is mainly because exchanges offers an easy way of storing, managing and exchanging multiple cryptocurrencies. Once you have an exchange account; generating a wallet address for any cryptocurrency is easy as well as instant. To avoid complexities you may think of storing your coins /tokens in your exchange account. But keep in mind that exchanges work like a bank. The main purpose for the creation of Bitcoin is to provide a decentralized system that operates without any central authority. 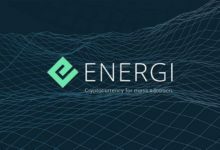 It is designed to give users the power to manage and control their own money. When you are storing coins on an exchange account remember that you are relying on a third party service provider where you don’t have control of your own funds. It is never a good practice to hold a large sum of coins or tokens on your exchange account even if it is a decentralized exchange. There is always a chance of exchange getting hacked. Also since Bitcoin and other cryptocurrencies are a store of value it is very important that you store your coins / tokes in a wallet where you control your private keys. But at the same time do you thing beginners can create and manage separate wallets for each and every coins they own? This is why there are several multi currency wallets out there where one can store and manage multiple crypto assets at ease. 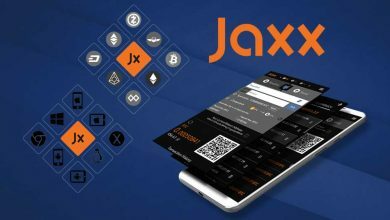 Previously we’ve reviewed Jaxx wallet. 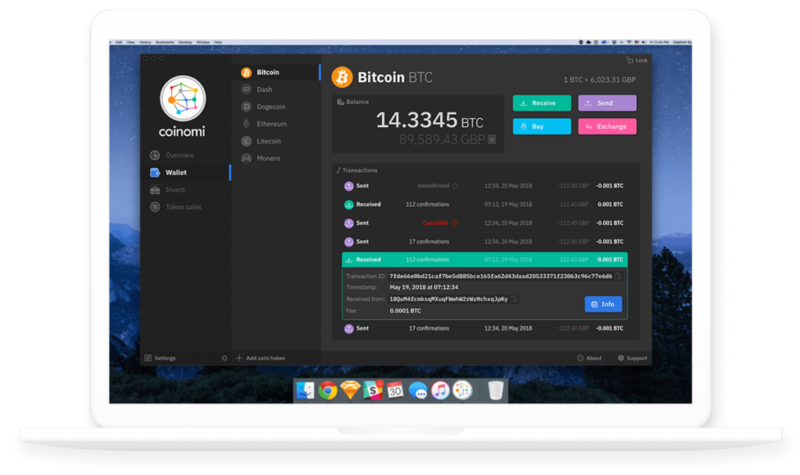 Similarly here in this beginners guide we’ll show you how to setup and use Coinomi desktop wallet – A universal wallet client that supports Bitcoin, Ethereum and a number of altcoins / tokens . 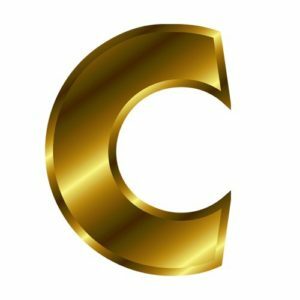 But before that let’s see why Coinomi and some of the features that this wallet provides. Coinomi is fin-techs finest multi-asset blockchain wallet where one can securely store Bitcoin, Ethereum, and more than 500 other crypto assets. 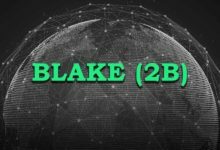 Founded back in 2014, it is the oldest multi-currency wallet available in the crypto space. Not only it is old but it also has a large user base. The reason behind the popularity is that Coinomi offers users an easy way to store and manage multiple cryptocurrencies. Not only it is user friendly but it also has multilingual interface plus a build in exchange with support for more than 500 crypto assets. Moreover Coinomi mainly focuses on security and privacy. Till date there are no reports of wallet being hacked or compromised, says “Coinomi”. This wallet has strong encryption feature and also offers enhanced privacy and anonymity. 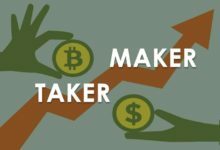 Now let’s take a look at some of its key features and then get straight into wallet setup guide. As we said Coinomi has support for more than 500 digital assets. It supports Bitcoin, Ethereum and most major altcoins / tokens. Moreover it allows users to add any ERC20 tokens (Ethereum tokens) to their application. In addition to that developers keep integrating key altcoins & tokens on a regular basis. 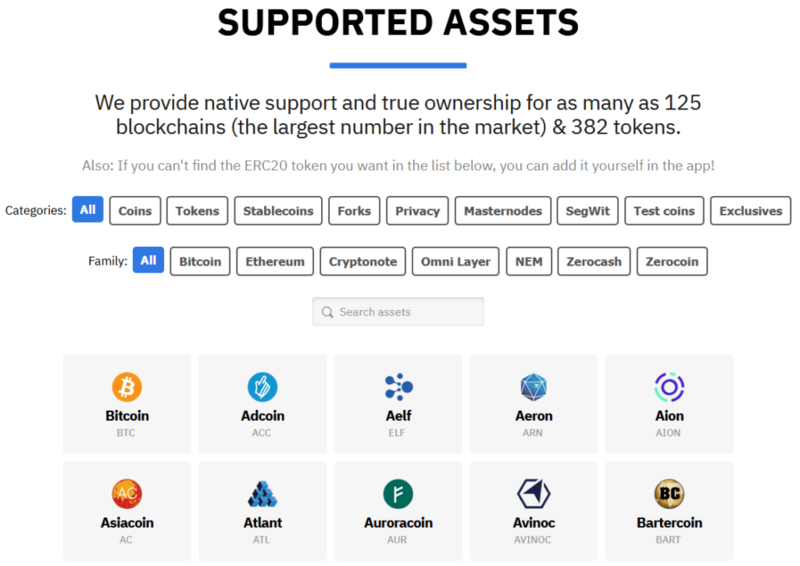 The complete list of supported coins / tokens can be found here. With Coinomi you control your private keys. Also to protect your keys this wallet offers strong encryption feature making sure the funds stays safe and under your control. 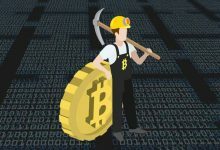 One of the biggest concern for cryptocurrency users is privacy. Unlike exchanges where you have to go through KYC regulations; there are no registration procedures involved to use Coinomi wallet. It doesn’t collect any of your personal information nor gather any data such as your IP address or your transaction details. Coinomi has partnered with ShapeShift and Changelly to provide users an easy way to exchange and convert altcoins within the app. This is extremely convenient for traders. A feature like this makes Coinomi one of the most versatile cryptocurrency wallet. Coinomi is a HD wallet (Hierarchical Deterministic Wallet – BIP44). When you initially setup wallet you’ll be provided with a passphrase which is all you need to backup. 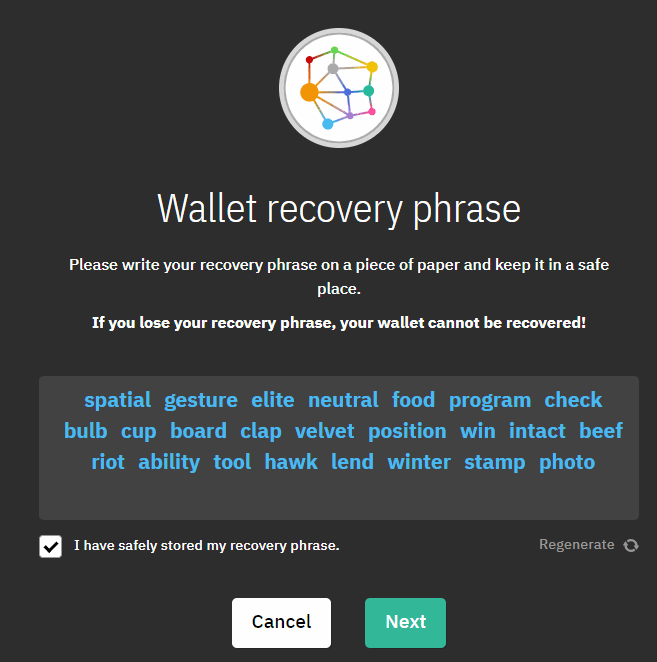 In case if anything goes wrong you can easily recover your wallet using this seed word. Coinomi provides the best customer support when it comes to solving users problems or providing advice. Particularly they are best at providing support for forked coins. For example they explain how to claim forked coins providing a step by step documentation which is easy for beginners to comprehend. Coinomi is SegWit enabled which makes Bitcoin, Litecoin and other cryptocurrency transactions faster as well as cheaper. Coinomi supports many languages such as: English, Chinese, Spanish, French, German, Russian and with more other translations coming soon. Coinomi is a popular multi currency mobile app. Previously it was only available for mobile (Android & IOS). 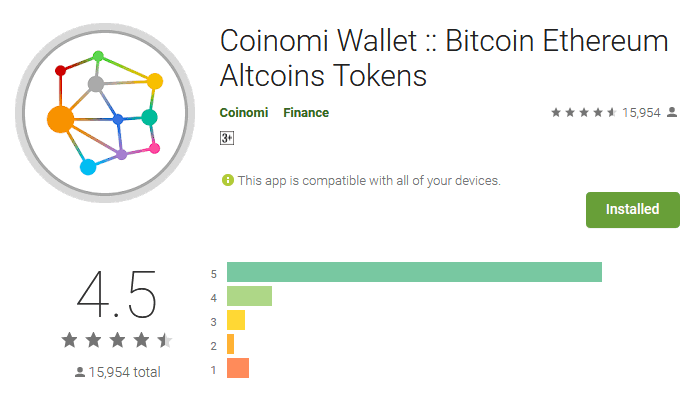 Users who preferred to use Coinomi on desktop used application such as Bluestacks and other android emulation programs. 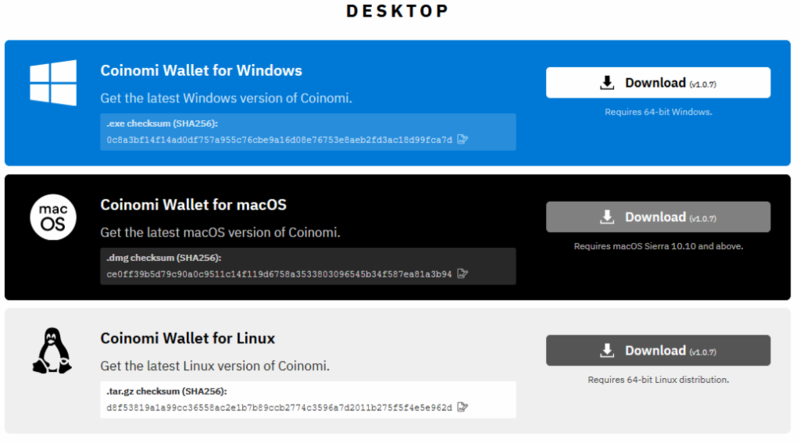 But recently Coinomi has released their own version of desktop wallet which is available for Windows, Linux as well as Mac. Coinomi wallet is 100% free to use. It is simple and a secure blockchain interface for all your devices. 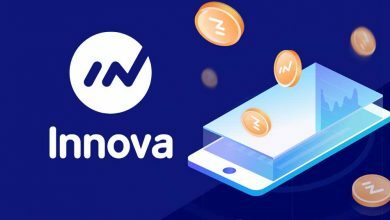 If you are currently using the mobile app then you can simply restore the wallet seed and manage the wallet from your computer. Now before downloading do note that Coinomi wallet software can be found on various websites and even torrents. Do not ever download wallet from anywhere apart from the official website. The wallet which you find on other website could be a malicious software that can be programmed to steal your funds. Head to https://www.coinomi.com/en/downloads/ and download the latest version wallet. Now before installing the application verify SHA256 checksum and ensure that the wallet software is legit. Once verified you can go ahead and install the software on your computer. The installation process is very easy and it only takes less than a minute. Just run the download file and follow the on screen instructions. Accept license agreement, choose wallet directory and complete the setup. As we said Coinomi wallet is cross platform compatible. If you are currently using the mobile wallet then all you have to do is restore wallet using the recovery phrase which you’ll find in your mobile. Once restored the wallet will be imported to your desktop computer which will reflect all your coins as it is on your mobile. 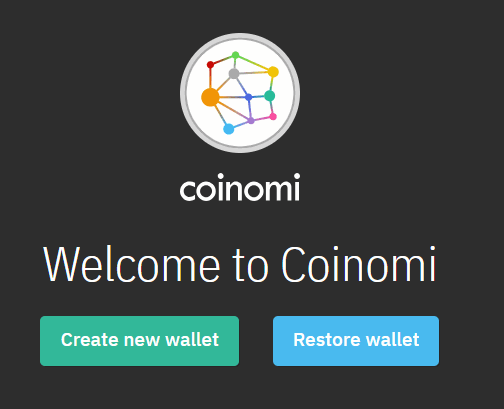 If you are new to Coinomi then click on create new wallet and now you’ll be presented with a wallet seed phrase. This wallet seed phrase is the most important of all. 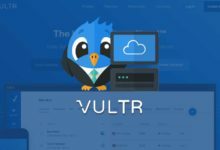 In case of computer failure or data loss; all you need to recover your wallet is this seed phrase. So write down this seed word in a piece of paper and store it in a secure location. Also remember to never ever share this information to anyone which if you do so then your wallet will be compromised. Once you have the copied the seed word check “I have safely stored my recovery phrase” and click on next. Now on the next screen you’ll be asked to confirm the recovery phrase. Choose the words in order and if you got the right sequence then you can proceed to the next screen. If not then the wallet will return an error message stating that the seed word is incorrect. Once you’ve confirmed the recovery phrase proceed to next screen and set a strong password for your wallet. It is recommended that you set more than 8 characters and be sure to use range of numbers, letters and symbols. More importantly memorize the password. You’ll be asked to enter the password each time when you make a transaction or when using the in wallet exchange service. In case if you forget this password in future then do not worry as you have the recovery phrase to restore your wallet. After you’ve encrypted your wallet proceed to the next screen and choose the necessary coins / tokes that you’d like to use in your wallet. This step is optional which you can add latter on from your wallet dashboard. Finally read and then accept the Coinomi terms of service to start using the wallet. Upon opening the application you’ll notice the wallet having a nice looking interface with simple navigation which even beginners can easily comprehend. As you can see there are only three main menu options in the dashboard such as overview, wallet and exchange. 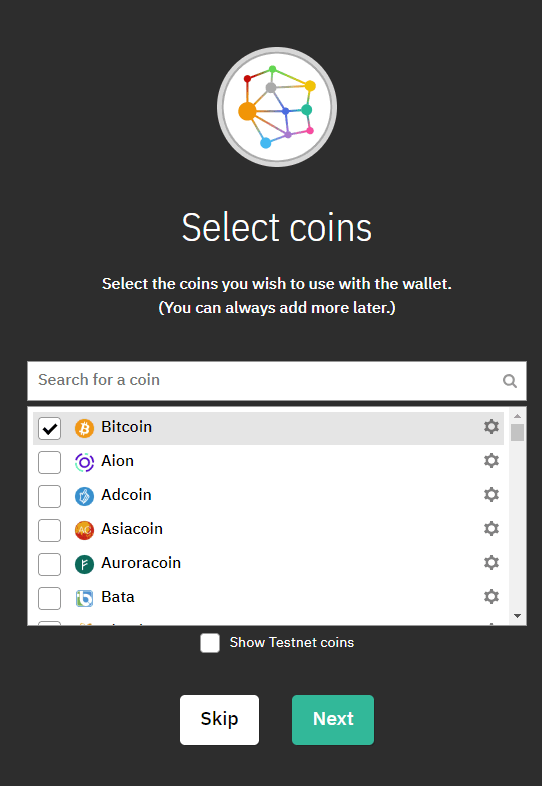 The overview section displays the list of coins / tokens that you’ve added to your wallet. Head to wallet menu to view transaction history and balance in detail. Also you can add necessary coins and tokens from the wallet menu. Navigate to exchange menu to exchange any coins you wish. The converted coins will be automatically added to your wallet. There is even a day / night mode which one can choose based on their preference. As we said this wallet is self explanatory and it offers a great way to store and exchange cryptocurrency. Just navigate around and you’ll pretty much understand everything about this wallet. 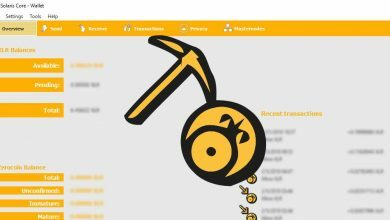 Using Coinomi is 100% free, there are no additional charges except the transaction fees which you pay to the miners. Alright! 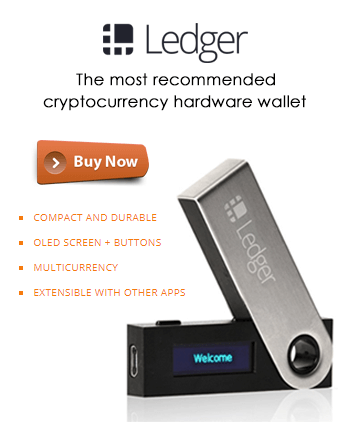 But how is the security and is this wallet trustworthy? How secure is Coinomi desktop wallet client? 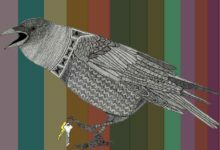 Coinomi has been around since 2014. They claim that they have “Thousands of happy customers and none of their wallets have been hacked or compromised”. It’s true, as you can see there are not much users reporting anything negative about their application or the service. But all those are mobile users. How about desktop client? On February 2019; a user reported that their wallet has been hacked due to a security vulnerability found in the Coinomi wallet. The issue was only with the desktop wallet and none of the mobile wallets were affected by this. The user reported that Coinomi sends plain text seed phrase to Google remote spell checker API when you enter it. While the above issue has been fixed what you need to note is “Coinomi is not an open source software”. Since the software is closed source nobody except the developers will be able to review the code. 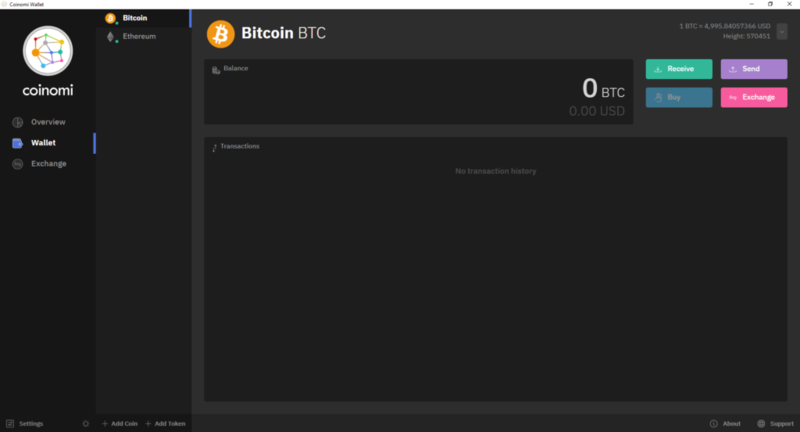 It doesn’t mean that the code could be shady but it means that it fails to delivery basic transparency and due to this Coinomi wallet has been removed from the Bitcoin.org website. 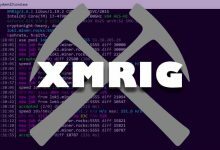 Anyways most of the popular multi currency wallets such as Jaxx, Exodus are also closed source. Although there are many multi currency wallets available out there; Coinomi is the only wallet that simplifies the process of holding and trading cryptocurrencies. Users of all levels can easily store, manage and exchange cryptocurrencies without much difficulties. 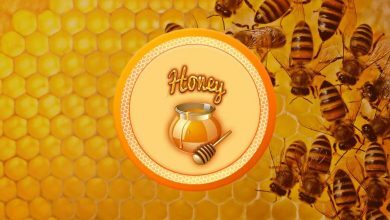 It provides the best security, privacy and moreover the best support to its users. Coinomi is one of the most powerful and most trusted multi-currency wallet on the market. An easy to use interface, huge altcoin support with exchange capabilities combined with strong community as well as an active development team is all what makes Coinomi a popular choice. With all that said; Coinomi is perfect choice for beginners and mobile users. It is suitable for everyday use but it not the right wallet to hold a large number coins / tokens. We suggest that you either use core wallet or for more security use hardware wallet that has multi currency support. What are your thoughts on Coinomi wallet? Is it easy to use, did you have any issues with security? Please leave your comments below.